The home, cottage, or commercial property buyer needs to know about Backflow prevention. 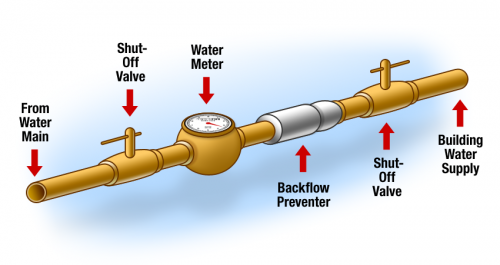 You may not have heard the term Backflow before but it is an important consideration when I inspect homes cottages and commercial properties in Orillia, Gravenhurst Bracebridge and throughout Muskoka. It is something that can affect the health and wellbeing of my clients and I am on the lookout for instances where plumbing is not set up for proper drainage and where renovations and remodeling may not have taken into account backflow considerations. 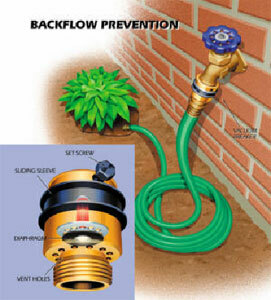 Backflow occurs when the normal and intended direction of water flow is reversed within in a water system. 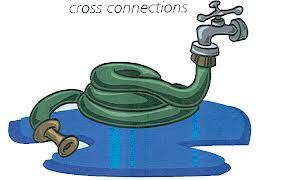 A cross-connection is a link between a potable (drinking) water system and a non-potable water system. Contamination can occur when a water supply line to a customer is connected to equipment containing a substance not fit for drinking, creating back-flow (reversal of normal flow of a liquid solid or gas). Devices and assemblies known as backflow preventers are installed to prevent backflow, which can contaminate potable water supplies. Backflow can also occur when plumbing and heating systems are incorrectly installed. 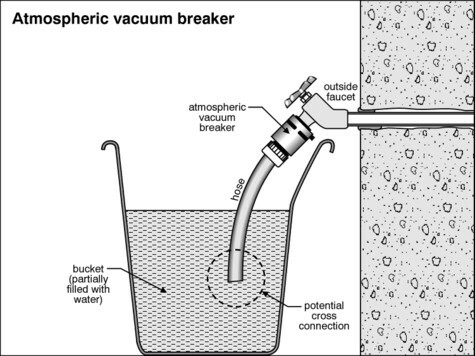 The drawing below illustrates a whole home backflow preventer which is designed to prevent any possibly contaminated water in the home from being sucked back or pushed back into the municipal water supply. Water goes from the main at the street through the backflow preventer into the home. With the backflow preventer in place it cannot flow back to the main line to contaminate the municipal supply. How does contamination take place? 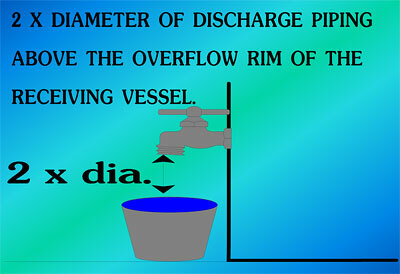 Back siphonage produces backflow caused by a negative pressure within a water distribution system. For instance in the drawing below Negative pressure caused by the break in the municipal line means the positive pressure in the home lines where the homeowner has connected a pesticide sprayer to the garden hose can push the home water containing pesticide into the municipal lines. This can then be possibly distributed to other homes, depending on how far the break is away. . Water containing chemicals from home heating systems are also under higher pressure than water in the municipal distribution network and can contaminate the drinking water. Both rural homes where no municipal water system is present and municipally served homes can fall victim to Backflow contamination in other ways. Pressure can cause backflow within a home system. In the drawing below we see the typical bulged out garden hose. It has been shut off at the hose handle but not at the old fashioned ( but common still ) outside faucet. Sitting in the sun has heated the rubber hose and expanded the water in it creating pressure. When the homeowner turns on the kitchen faucet for a drink of water any contamination in the hose that may have been hanging in the garage all winter or laying in the dust and dirt all summer flows under pressure into the home system. You are drinking whatever that garden hose has been laying in for years. A vacuum type breaker solves this dilemma. In the drawing below a vacuum breaker installed on the hose bib prevents the build up of pressure in the hose in the first place. Backflow is a health issue. Backflow can be a problem in a water system because when it occurs it will spread any contaminated water back through a clean water distribution system. Backflow at uncontrolled cross connections (cross-connections are any actual or potential connection between the public water supply and a source of contamination or pollution) can allow pollutants or contaminants to enter the potable water system. Sickness and even death can result from ingesting water that has been contaminated due to backflow. An inadequate installation in your building could cause the contamination of your well water or your municipality's drinking water supply, with potentially disastrous health consequences. Drinking contaminated water can cause stomach ache, diarrhea, skin blisters and even death. 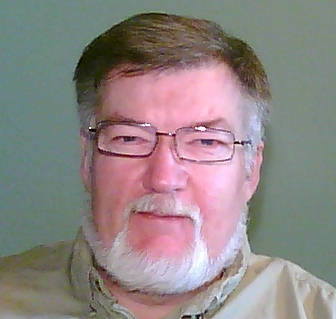 Were it proved that the contamination of the drinking water distribution system originated from your building, in some municipalities in Ontario you could be charged with a criminal act and have to pay hefty cleanup costs. Preventing contamination: the Air Gap. An air gap affords the best protection possible. 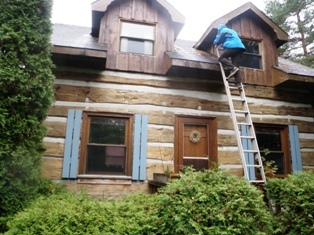 This is something I check for on all my Home Cottage and Commercial inspections. This is an air space between the faucet and the overflow level of a fixture. In a lavatory, for instance, it is the air space between the faucet and the fixture's overflow level. This space must be sufficient to ensure that contaminated or dirty water overflowing the lavatory cannot get into the drinking water through the faucet. All fixtures, and drains must have an air gap including the condensate line from the heating system where it goes into the floor drain. Hooking a hose up to a valve removes the air gap. Many times in Orillia, Gravenhurst, Bracebridge, and Muskoka while on a home cottage or commercial inspection I have found owners have extended condensate lines that now touch the water in a floor drain. Most do this in an effort to quieten dripping noises. I also find added hoses inside and out added to hose valves that allow hoses to sit in water. Accessories installed on lavatories such as hand held shower heads for hair washing can easily compromise the air gap. I have even seen a dog washing station that use a hand shower assembly connected to the sink and sitting in a pan of water the dog just got out of. Imagine drinking that! Hose connection vacuum breakers are made specifically for portable hoses attached to hose faucets. 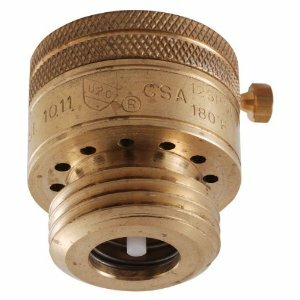 Like all other backflow preventers their purpose is to prevent the flow of contaminated water back into drinking water. These devices screw directly on to the faucet outlet. They can be used on a variety of installations such as: service sinks, hose faucets near a wading pools, and laundry tub faucets. Backflow prevention may not be something all my clients know about and it is up to me during my home cottage and commercial inspections to let all my clients in Orillia, Gravenhurst, Bracebridge, and Muskoka know about the importance of backflow prevention and the health issue it represents.